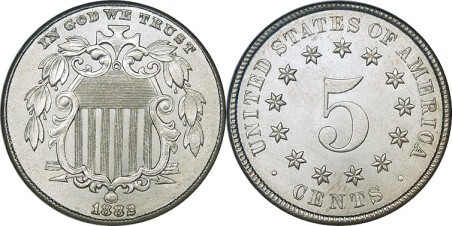 Shield Nickels were made of 75% copper and 25% nickel, and were produced from 1866 to 1883. 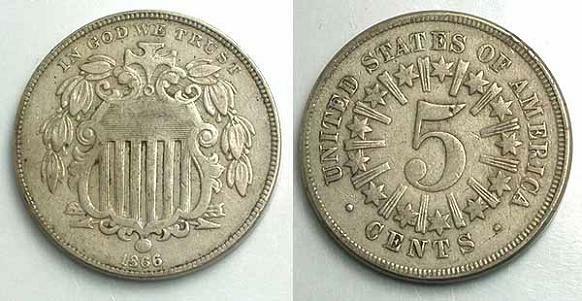 A shield is featured on the front (obverse) and the numeral 5 surrounded by stars on the reverse. Early varieties had rays between the stars on the reverse (1866-1867). These were later removed, hoping to get better strikes on the coins. These coins are another US coin that came about because of the hoarding of precious metals during the Civil War. The government had issued fractional currency, which was paper money in fractions of a dollar (3, 5, 10, 15, 25 and 50 cents), but people hated them, they wore out quickly, and many merchants refused to accept them. So, a nickel five cent piece was produced to replace them. 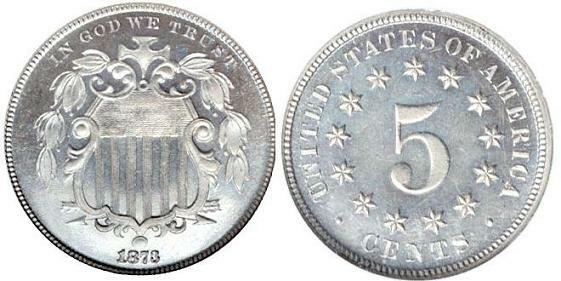 This was the first nickel five-cent piece minted in the United States. Previous coins that were called nickels were actually one, two and three cent coins that were made with nickel. 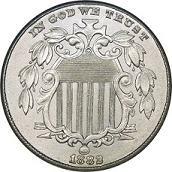 Nickel is an extremely hard metal and it was difficult to make coins from it in 1866 when these nickels were first produced. The machinery just couldn't handle this hard metal. Because of this, there are many minting errors in this nickel type. A fine raised line on a coin that was caused by a crack in the die..
Today's modern minting equipment, however, handles nickel just fine. For some great deals on U.S. Shield Nickels and Coin Supplies visit my friends at Jake's Marketplace, Inc. They have a very comprehensive selection to choose from and give great discounts!